We're very excited to let you know about a great new video tutorial series we've produced on how to get the most out of Insightly, that we've nicknamed "Insightly University". The series is comprised of 14 short videos that guide you through how to use different features of Insightly, and they're all under 10 minutes in length so you can watch just one or power through them all to become a true expert, or what we affectionately call an 'Insightologist'. We've also included a series of frequently asked questions and answers about Insightly, and a new interface for submitting a support ticket to our wonderful support team. This is all available right now from our new help website at http://help.insightly.com or from the blue help icon the the top right of Insightly after logging in (as shown below in red). For the past couple of months we have been working on bringing some powerful new reporting functionality to Insightly, which is one of the most requested features from our fast growing user base. We've got nine reports available in this initial release centered around opportunities and activities, and we're going to add additional reports in the near future. 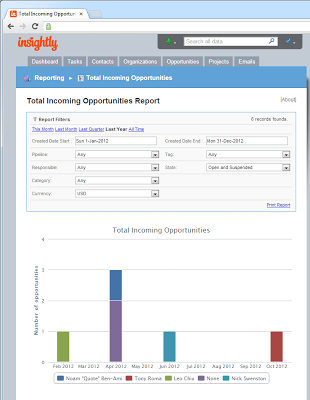 The new reporting section can be accessed via the multi-colored bar graph icon in the top right of Insightly after logging in (as shown below in red). All of our reports have a few handy hyperlinks at the top to filter records created this month, last month, last quarter, last year, or all records. When you run a report we display the number of records found in the header, and a handy hyperlink to format the report for printing. How many opportunities do you have in each of your opportunity categories ? This report graphs the number of opportunities you have for each of your opportunity categories in a donut chart. You can filter your opportunities by forecast close date, pipeline, responsible user, currency, tag or opportunity state. With this and most of our reports, the tabular data that makes up the report is displayed below the graph. What are the main reasons you lose out on new business ? This report will graph the number of opportunities you lost and the reasons why you lost them in a donut graph. When you lose an opportunity in Insightly, you have the option to give a reason (which can be configured under Settings > Opportunity State Reasons). In this report we will graph all the opportunities you lost for a given set of criteria, so you can easily see the main reasons that you're losing out on new business and how you can improve in the future. At what pipeline stage are all the opportunities you have open and set to close in the next quarter ? This report graphs the number of opportunities in each stage of an opportunity pipeline, filtered by Forecast Close Date. It's a great way to tell if most of your opportunities are at early stages in a pipeline or if you have progressed them through to later stages and they are closer to closing. You can filter by pipeline, forecast close date, or by responsible user, category, currency, tag or opportunity state. Which of your sales people closed the most opportunities in the last quarter. Which sales people generated the most revenue last year? This report shows you which users generated the most new opportunities, or the most revenue in a given time period. You can filter by the number of wins, or by the total revenue of opportunities won in a given currency. It's a great way to see who is your most productive sales person, or who contributed most to the bottom line in the last quarter. Which client organizations contribute the most to your revenue ? Which of your clients do you have the worst opportunity win record against ? This report will show you a breakdown of which organizations make up the opportunity volume generated by your sales team in a given time period. You can filter by pipeline, current opportunity state, tag, category or even currency. 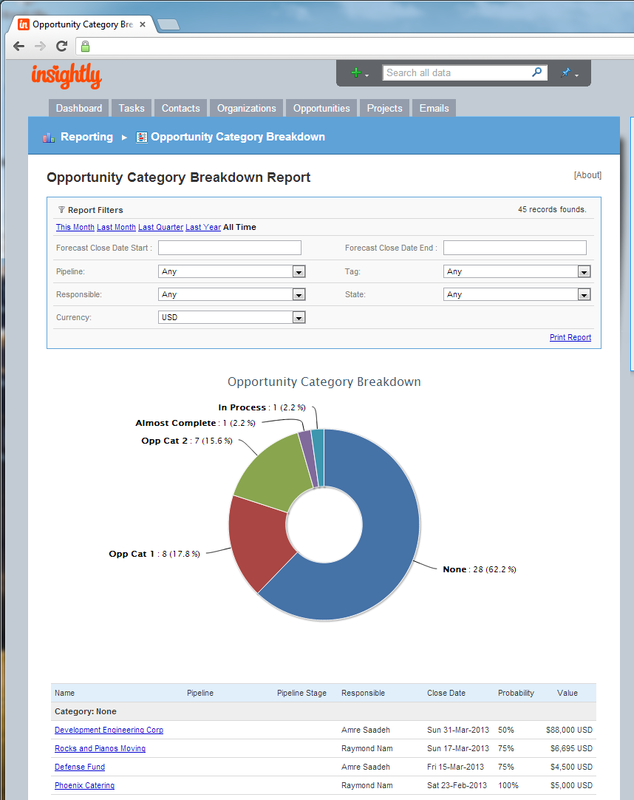 This report will provide a breakdown of the number of opportunities with each value set for a custom field. If you use custom fields for opportunities to segment your opportunity list then this report can be useful in graphing the breakdown of values for those custom fields. How many opportunities did each of your sales people create by month last year ? This report shows you how many new opportunities each of your sales people created in a given time period, so it's great for determining deal flow from each of your sales people, and who is the most productive sales person you might have. The 'value of opportunities won' report below is the compliment to this report and graphs by revenue rather than deal volume. Which of your sales people was the most successful in January and February in revenue generation ? This report shows you the total revenue value of opportunities won in a given time period, broken down by responsible user. It's great for determining which of your sales people contributed the most to top line revenue in a given time period. You can identify the most and least productive sales people in your organization. Which of your users completed the most tasks assigned to them the last quarter ? Which organizations did you have the most phone calls with last year ? Which opportunities created the most work for you in follow-up calls and emails last month ? Did you complete more tasks in November or December last year ? This is one of the most powerful reports in the arsenal, and graphs the number of tasks completed, and meetings and appointments scheduled in a time period - broken down by either responsible user, linked organization, opportunity, project, or in total by month over a time period. The key filter here is the 'Type' filter and gives you some great insight into which projects, opportunities, or organizations have required the most work to get over the line. We will be adding more reports over time, and if you have a specific report you would like to see added, please add a descriptive comment to this post. We hope you like the new reporting system, the 'Insightly University' tutorial series, and the new help site. Thanks for being wonderful customers. Love it! 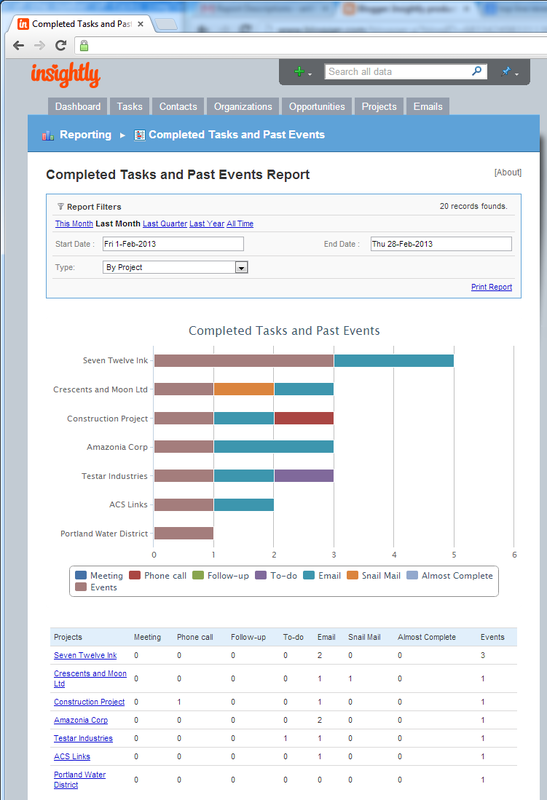 Would also love to see open tasks reports and task completion vs deadline reports. On time task completion % - what a cool (scary) metric! Will pass this onto our product team. Likewise having a advanced filter for tasks and reporting on time from task start to completion would be nice. Ditto to this. I need the ability to see a report of future events. Ditto, printing future tasks would be great. Having some kind of permissions for the report viewing would be great, I don't want all the employees to see our revenues for the year!! Good suggestion. Will pass onto our product team. Just found out from our product group that the reports only include information on opportunities where the requester has viewing permissions. Hope this helps. Would love to see reports for Projects. Could pull in graphs for all the tasks associated to that project as well as all the notes. Be perfect for leasing activity reports for the real estate business. 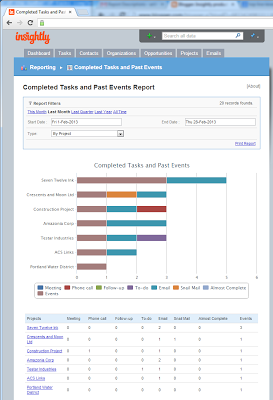 The 'completed tasks and events' report (last one on the list when you click on the report icon) shows a summary of tasks by projects. Open tasks report are really needed when discussing project progress with clients and others. A must!! This is great so far! How about a way to export a report, so we could put the data in Excel and then use in PowerPoint to make nice graphs, etc.? That would REALLY be helpful! Great! Now if only we could customize the opportunity value field! Now, am I not getting it, but is there no option to see the total value, in most of the reports this would be helpful, ie. to see how many value within one categorie, one individual. FYI -- in some of the reports, the total value is shown in the graph callout (although not the table below). For example, Opportunities by Organization shows the total value in $$ and % in the graph. Laura, please do something nice for yourself after you fulfill everyone's requests--you've earned it. I appreciate these changes, but how in the world did you miss adding the capability to edit a contact's title after they have been previously added? This is so basic, and so annoying. You can edit a contacts title from the links sidebar on the right hand side of the contact details page. We've had that since day 1. As a management consultant who visits clients, I would love to be able to generate a report that I can quickly print off (for Opps and Projects) that provides an overview, including tasks and notes particularly. Also, can we PLEASE have the ability to mass delete files. We literally have hundreds of annoying little files that Insightly picks up from email footers. To get rid of them, you have to delete them one at a time AND confirm you want to delete them. We need a mass update/delete checkbox at the top and then be able to deselect the ones we don't want to delete (similar to the Contacts mass update function). I propose changing the date that you use to filter in "Opportunities by Responsible User" form "forecast close date" to "won date", to get reports that are more accurate. The problem is that insightly does not record the "Won date", so we have to manually change the "forecast close date" to the actual "won date", when we win the project. This is a great new feature. One thing that would be VERY nice would be to have the report filter criteria included on the report print out! Opportunity reports are great, however for most of them I can see results for 1 currency at a time - ie I have to select currency, and then I see only opportunities which use this currency. It would be helpful if I could get reports for all currencies at the same time. For example, in Reasons for Losing Opportunities report, currencies are irrelevant and still I cannot get summary report over all currencies. Thanks! Hey, some of my best friends are doughnut pie charts! :>) Please suggest other types of data visualization that would work for you and I can take those suggestions to my product team. On the task report: if my task doesn't have a category it doesn't show up in the report! Can one of the categories be "no category"? Is there a way to export the contact list? I'd love to export to excel all the contacts in the list. Yes RobinT there is. From the contact window choose "Export Contacts" from the box at right. - Insightly generates a CSV file that you then cut and paste into a text document. Hello, is there any report that takes the probability of winning and multiplies it by the value of the opportunity or is this something that must be done by the user? Example, I would like to know the true value of an opportunity, if I have a 10% chance of winning an opportunity worth $10,000 it should only show $1,000 in one of the reports so that users can target the highest valued opportunities first. Actually it would be great if all the reports have the option to choose between number of opportunities and value of the opportunities. 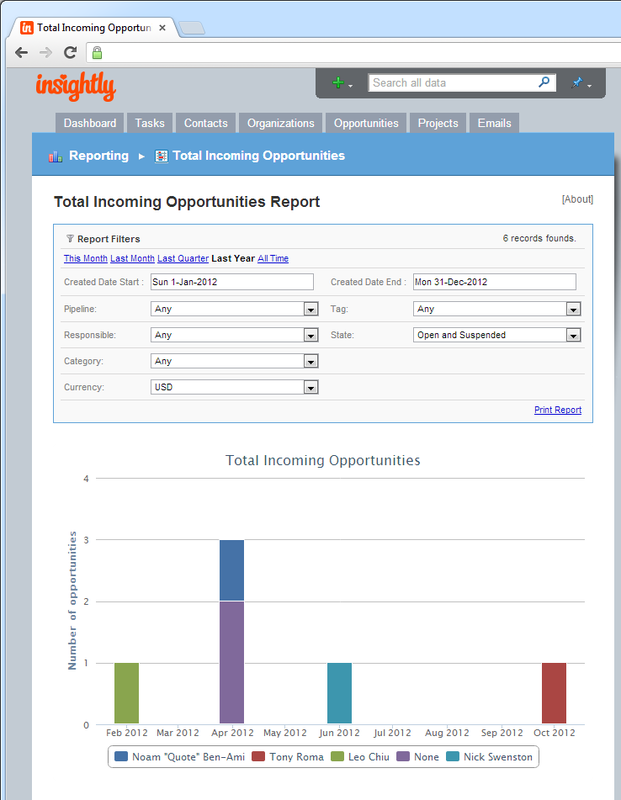 Total Incoming Opportunities Report should be available both on 'Creation Date' basis and 'Forecast Close Date' basis. We are using your tool in a slightly different way than it was intended. Because of this none of the reports really provide what we need to see. How about a totally customizable report, where you can select the fields you want to report on and set filters based on these fields. Agreed! I need one of these that combines opportunity, organization and a few custom fields and opportunity fields. 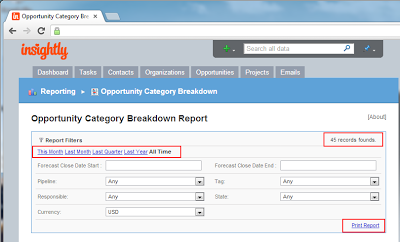 I guess it has been mentioned but Opportunity Reports lack the "By Value" functionality most of the time. Number of opportunities is not what is useful for the business (at least for us). Total value of opportunities by categories or organisations or custom fields is needed. Also the Probability should be linked to the stage of the opportunity. I am also seeing problems with the Funnel Analysis report. It is only picking up a couple of my opportunities. Any thoughts Insightly? Send an email to support@insightly.com and we can answer your questions. Please create a 'Dashboard' feature which enables the display of multiple components created through custom reports. The lack of such dashboard, which gives a real-time snapshot of the organization's key metrics and KPIs might cause companies like ours to switch to other CRM solutions. agreed. Check out Mothernode CRM Goals and sales pipeline dashboard. Best I have found anywhere for sales. Please - from a salespersons perspective take a look at how MotherNode CRM has configured their sales pipeline dashboard report. It breaks down where you are and your goal targets by month, quarter and year. Gives you the option to put it right on your dashboard where it is a great motivator - or hide it if you are not in sales. I suggest you copy this and implement into Insightly before your next release.